Beautiful, small but perfect for makeup vanity. Very good quality and sturdy to sit on. I loved it so much, I ordered two more. Safavieh Georgia White Vanity Stool - 17.9" x 19" x 22.8"
Safavieh 17.9" Georgia Vanity Stool - Blush - 17.9" x 19" x 22.8"
The adorable Georgia vanity chair is petite enough to tuck in a bathroom or bedroom, and brimming with feminine style. Graceful birch wood legs with weathered oak finish, deep seat and diminutive button tufted back are designed for indulgent comfort. Upholstered with beige viscose/linen blend fabric with self-welting and brass nail heads for a decorator touch. The elegant design of this chairs matches many vanities and washroom designs. The small, brass accents add to the chair's aesthetic versatility. The beige linen fabric and natural wood construction create a sturdy chair for daily use. The chair is pre-assembled and ready for immediate use, to accent home seating. I just received this vanity chair today, and am so excited. The upholstery is beautiful. It's much richer than it looks online, with a sturdy, comfortable seat. The nailheads are a little wonky, but to me it just adds to the charm, but if you're particular about uniformity, beware. The packaging was awesome. The chair was wrapped beautifully and there was no way it could have been damaged in shipping due to negligence. What a great addition to my bathroom. It's very sturdy and the legs are uniform and exact in length. I hesitated to order online, but couldn't be more thrilled. I absolutely loved this chair. Although, I had to return it. I wanted it in white. When I received the chair, it was off white. I was so disappointed. I was searching my house desperately to see where else I could put it. Unfortunately, I had no where in the house that I could squeeze (for now any way). I ordered it in black and it's just as precious as the off white chair. It's made well. The silver nail heads add such a charm to it. it's not a chair to sit in for a long time; I put it in my daughter's room in front of her mirror and she uses it to put on make up. It's also a great extra seat in her room. You cannot go wrong with this vanity chair. Its really good, nice colour, fabric and quality but wish it was a little deeper. I have placed it infront of the mirror. The actual depth from back rest to edge of seat is 36cm (14 inches) The width is fine with me. This vanity chair look great in my master bedroom. It beautiful beige linen an se the legs have a rustic look. 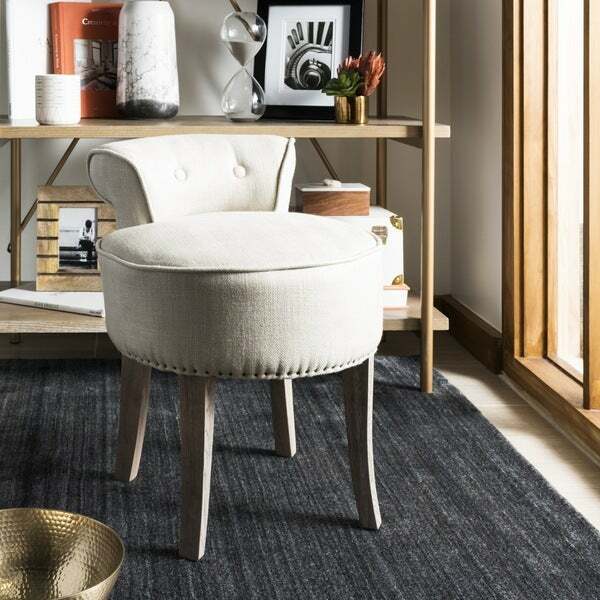 Perfect little accent chair/vanity chair. Will compliment any bedroom area. This stool is perfect for my daughters vanity. The soft beige matches any decor. Besides being very sturdy and well made, the seat is very well padded making it comfortable to sit on while you are getting ready. i bought this chair to use at my vanity in my bathroom. it's so pretty! and rather comfy. I love the style-its a little different from what i'm used to seeing and it's so elegant. since i use it as my vanity bench i do tend to get make up on it BUT i've learned its really easy to clean. so far all my little make up marks have lifted. Large plus for me. Very happy with this stool at the price. The leg color is a light beige, which goes beautifully in my grey and white bathroom. It came wrapped and fully assembled and arrived much sooner than the expected delivery date. Very pleased with this purchase! Love this adorable little stool. It goes perfectly with my mirrored vanity. I only wish it were a couple inches taller, but overall I have been very happy with this purchase. sturdy, and comfortable. The studs that finish chair could be better quality. Really pretty and perfect height for a built in bathroom vanity. Luxurious look and feel. I have 2 of these for the 2 "beauty areas" in my older home. Perfect size, comfort and height. These are hard to find, and the colors and materials are good quality. I bought this for my guest room. It is intended for a vanity table and is small which I like. It was just to give guests a place to sit to put on shoes etc. it's more like a stool than s chair. It was perfect for me. Nice chair but it takes up more space than your would think. The dimensions were somewhat helpful but the chaise part versus back rest made the chair take up more space than I expected. Otherwise very nice chair. It’s as pictures and perfect no assembly required, just take it right out of the box which is always a plus!!! Love this stool! Perfect height for the built in vanity in the bathroom cabinetry. It has held up well to my three daughters & since it does not have a high back, it makes it easier to fix their hair!! We love this stool for our vanity! It is sturdy and beautiful at the same time! This chair is high quality and fits nicely in the intended spot in our master bath. It adds a touch of class to the room. Perfect chair for my vanity. Very happy! "Why does this say it's white, when it's oatmeal/beige color. Is there somewhere to buy the chair in the photo?" Please be assured that this chair is a beige/oatmeal color (as pictured). We will make a correction to the description. It appears to be perfect for my vanity which is a similar color, upholstery appears nice and like the short back support. "Is there a weight limit?" Hello shopper, thank you for your inquiry. Unfortunately Overstock does not weight test our items; typically this type of chair holds up to 200-250 pounds. Thanks for shopping with us.